Ranch Home & Garage Online Auction — Harritt Group, Inc. This property did not sell at auction but it is still available. 10% non-refundable down payment due within 24 hours following the auction, balance due in 40 days. Taxes prorated to day of closing. Possession immediate at closing. Selling as is with no contingencies, all inspections welcomed prior to the auction. Recently updated 4 bedroom – 2 baths one level ranch home in the heart of Georgetown, IN. with large detached heated garage on .55 acre lot located off St. Rd. 64 just 3 miles West of I-64. Great opportunity to own your new home or next rental property in Floyd County. 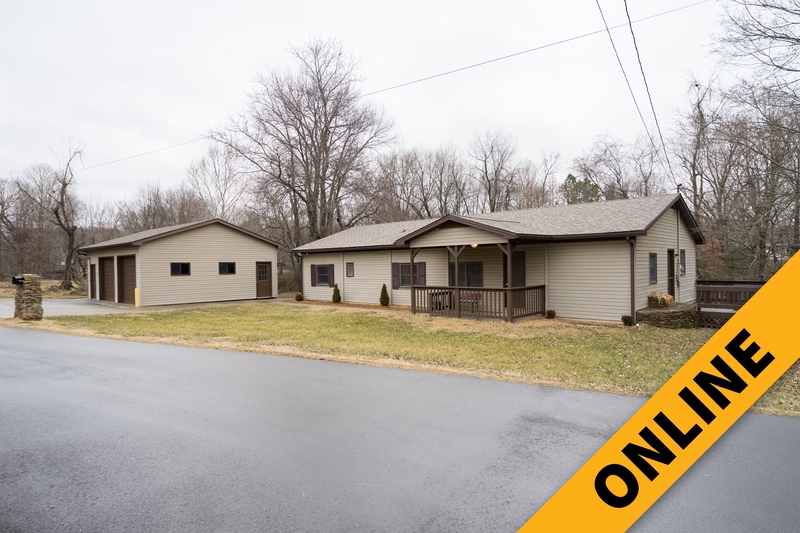 Recently updated & remodeled 1568 square foot one-level 4 bedroom – 2 bath vinyl sided ranch with covered front porch, 2 wood decks, detached 2-bay heated garage plus utility garage on .55 acre lot on dead end street located near Georgetown Elementary School. The original renovation of this home in 1986 included a full enclosure and interior updates of a 672 square foot mobile home plus a 4-room 896 square foot addition. Ready to move into, this home features updated kitchen, a master suite with remodeled bath and tiled shower, large open family room with french doors to either your 4th bedroom or office overlooking large backyard, fresh paint and new flooring throughout, new light fixtures, new interior and exterior doors, gas forced air heat, central air, laundry mud room and clear access to attic and crawl space. A detached 2-bay garage is ready for vehicles and a wide variety of hobbies. The main 24’ x 32’ area of the building features 2 large automatic electric garage doors, built in storage shelves, separate breaker box & hanging Trane furnace while the attached 10’ x 14’ utility section has a manually opened garage door – perfect for storing lawn equipment or an ATV. Do not miss this excellent buying opportunity! I-64 to Georgetown Exit# 118. West on IN-64 for 3.3 miles to right on Bowman Drive. Home on right.